Every child, parent, relationship and situation is unique. But there are two keys that I think fit every family, and those are: love (fostering connection) and respect. 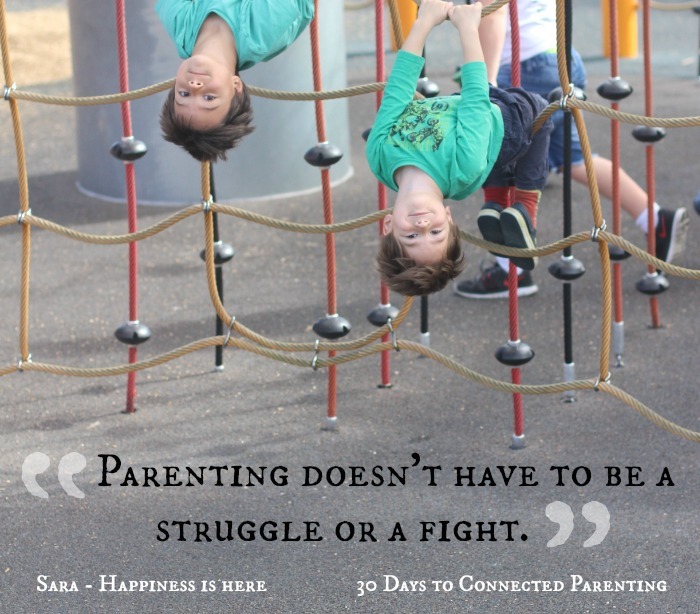 Last month, two of my favourite bloggers published an insightful series called 30 Days towards Connected Parenting which, if you believe in love and respect as the core of parenting, will challenge you to think about how you parent and give you ideas for doing even better. I am proud to have met these two mamas in person and know just how passionate they are about respectful parenting, and I often have “aha” moments myself when reading their articles. I invited Sara and Rachel here today to tell us a bit more about themselves and the series. If you are looking for new ideas and insight into parenting – you will definitely want to check out their work. Sara: I’m a Mum of 4 girls aged 6, 4, 2, and 3 months! We live in Queensland Australia and have chosen to home educate our children. I blog at Happiness is here where I love to talk about education, our unschooling lifestyle, respectful parenting, some learning activities, and whatever other adventures we have! Rachel: Hi I’m Rachel the passionate mama behind Racheous – Respectful Learning & Parenting. I’m an advocate for children’s rights, parenting respectfully and home education. My children are my inspiration – my son is almost 6 years old and my daughter is 3.5 years old. Why did you create the 30 Days to Connected Parenting series? And what do you hope readers will get out of it? Sara: Rachel and I are great friends in real life and we love to talk about parenting together. We’re both so passionate about respectful parenting and we really wanted to get the message out there that parenting doesn’t have to be a struggle or a fight. You can gain so much in your relationship with your kids by focussing on connection instead of correction. I hope readers will be challenged to think of children and parenting in a different light. Rachel: We created the 30 Days Towards Connected Parenting series because we recognised how so much of parenting blogs and books and information is about doing things TO children, rather than working on ourselves as parents and empowering parents to work with children and change the narrative that is ingrained into our global society. What I hope readers gain from the series is an awareness of the power of connection and how a shift in focus can ultimately transform your relationship with your children. What is your favourite post in the series? Sara: That’s a tough one! I’d have to say my Readjusting Expectations post. I love to challenge people to think of children differently and recognise how trustworthy and capable they really are when given the opportunity. Rachel: My favourite post personally is my final post in the series Exploring Your Weaknesses as a Parent as I find it such a vital place to work on to promote healing and change how we approach parenting as we process our own baggage. Huge thanks to Sara and Rachel for writing such an honest and wise series of posts, and for taking the time to share more of their story with us here today. 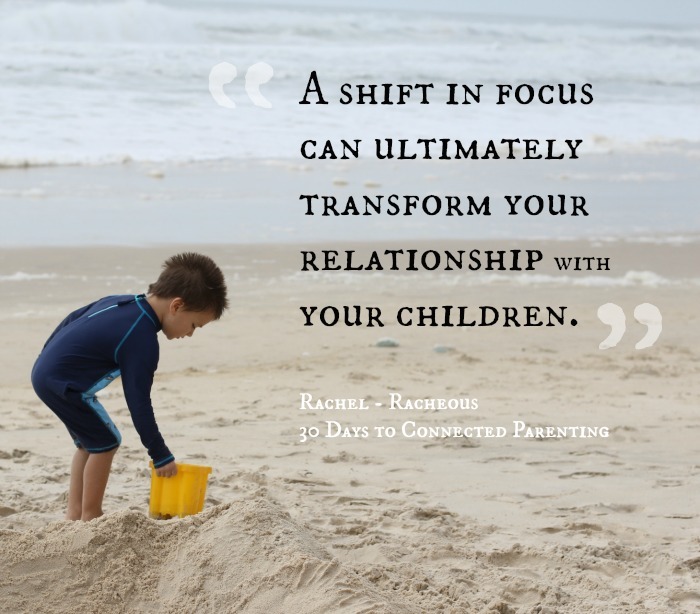 I hope you go check out 30 Days to Connected Parenting, and follow their blogs on Facebook for continued inspiration: Happiness is here and Racheous – Respectful Learning & Parenting.